You’d be hard-pressed to argue against the fact that the greatest unscripted reality television saga in all of sports, at this very moment is the University of Tennessee’s search for a new head coach for its football team. But like great reality television program, the intrigue may involve the main characters you see on the screen, but it’s created and directed created by the people behind the scenes. Regardless of what fans may think, former Athletic Director John Currie was not in control of the search for the team’s next head coach, from the very moment he was given the (supposedly) unchecked authority to hire someone (which was clearly a charade), through the moment he was unceremoniously fired from the position. Phil Fulmer, Tennessee’s beloved Hall of Fame coach and new Athletic Director isn’t the one in, either. Fulmer might currently have risen to the position of AD this time around, but don’t forget that, as other outlets have reported, Fulmer was originally passed over for the position by “powers that be” in 2008, when the position became available after Dave Hart stepped down. If Fulmer was marginalized once, even after bringing the school a National Championship, there’s little reason to think that couldn’t happen again. In actuality, the people who are actually orchestrating the Volunteers’ head coaching search are the cabals of very wealthy—and thus, very influential—donors to the program; in other words: the boosters. And because of a Hatfield’s vs. McCoy’s-esque battle for the ultimate control of the program, it has resulted in one of the most bungled and embarrassing coaching searches in college football history. On one hand, there’s the Haslam clan, who have essentially positioned themselves as the royal family of the University of Tennessee. James Arthur Haslam II, known by many within the Tennessee community as “Big Jim,” is the founder of the Pilot Corporation (the nationwide chain of gas stations and convenience stores), and the patriarch of the clan; he’s singlehandedly donated tens of millions of dollars to the school over several decades. Haslam’s two sons are Bill and Jimmy; the former is the Governor of Tennessee, and the latter is the CEO of the Pilot Corporation, as well a former minority owner of the Pittsburgh Steelers, and the owner of the Cleveland Browns. If you want a glimpse at just how much influence they have in the Tennessee athletic program, consider the fact that when Fulmer was interviewing for the Athletic Director position, the final interview took place at the Tennessee governor’s mansion – where Bill Haslam lives. 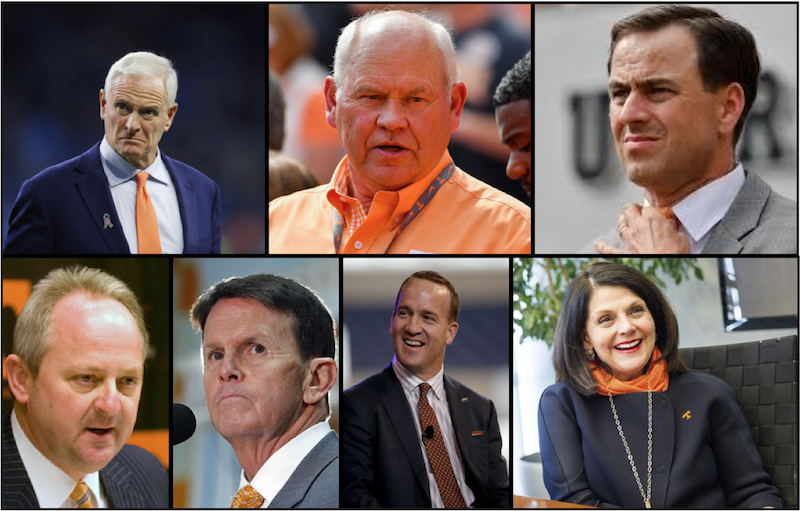 Two of four people interviewing Fulmer were Haslam’s: Bill, and “Big Jim” (along with Hall of Fame quarterback Peyton Manning – who has become a Haslam-family ally – and University of Tennessee Chancellor Beverly Davenport). And it was the Haslam family that pulled the rug out from underneath Fulmer, when they gave the job to Currie, with full intention of making him a hollow puppet to whom they could dictate all important decisions about the program. So the decision to make Currie the lead in the head coaching search was basically a power play by the Haslam family to not only control the entire process, but wrest it away from any of the other Tennessee’s influential boosters. And if one of Currie’s decisions backfired, it allowed the Haslam’s to make Currie the fall guy for it. After all, while Currie took the brunt of the public vitriol in response to the decision, it was the Haslam family who essentially stronghanded Currie into offering the job to Greg Schiano, based on an edict from Jimmy Haslam. Haslam once wanted to hire Schiano as head coach of the Cleveland Browns back in 2014, but was talked out of the decision by members of the team’s front office (it’s also worth noting that he ended up firing those front office officials — Joe Banner and Michael Lombardi — later that year, when the Browns ended up going 7-9, which was their second-best record in a decade). Given the unmitigated catastrophe that was the Schiano almost-hiring, coupled with the fact that Tennessee struck out with Mike Gundy, David Cutcliffe, Dave Doeren, and Jeff Brohm, it likely opened the door for the other faction of Tennessee’s other boosters to wrest back control of the search, as the program continued to have egg after egg cracked on its face. There’s no way that Charles Ergen (CEO of Dish Network), Charlie Anderson (CEO of Anderson Media Corp), and Raja Jubran (CEO of Denark Construction), and the other highly-influential boosters could sit by and watch the Haslam’s, vis-à-vis John Currie, continue to exacerbate this mess. Their ace in the hole was Fulmer himself, who likely allied with said faction after he was originally snubbed and duped by the Haslam’s. It’s very likely the rest of the Tennessee boosters made their move just as Currie was set to finalize a deal with Mike Leach, as a power play against the Haslam’s – even if, at some level, it was cutting the program’s nose to spite its face. Leach, who nearly led Washington State University to a Pac-12 title this season, would have been very well received by Volunteer fans. His “Air Raid” offense would’ve been a welcomed sight to Tennessee fans, who spent too much of 2017 watching a completely lifeless offense under Butch Jones. Leach’s brash and swashbuckling ways would also have been the perfect foil to Tennessee’s #1 persona non grata in Nick Saban. Simply put: if Currie hired Leach, and if Leach turned out to be a success in Knoxville, it would put Currie – or more accurately, the Haslam’s – in a position of almost unmitigated power. That’s the main reason why Currie was fired, literally hour before he almost saved this disastrous coaching search. The anti-Haslam faction was sick of the Haslam family trying to flex its muscles and belittle their fellow boosters, and they couldn’t afford to allow the Haslam’s power to grow. So they moved to replace Currie – the Haslam stooge who might’ve become the most hated man in the history of the athletic program – with Fulmer, knowing that there’s no way the Tennessee faithful would object to that move, and knowing that Fulmer would be far more sympathetic to the non-Haslam faction for finally giving him the opportunity he sought for years. But as a fan of the program, you have to ask yourself: in the aftermath of this battle between multi-billionaires, what was ultimately accomplished? The Volunteers still don’t have a head coach, and the list of candidates is growing smaller and smaller. Kevin Sumlin has reportedly turned down overtures for the job. Tee Martin, who everyone presumed would jump at the opportunity to come back home and coach at Knoxville, is reportedly unhappy with the fact that his name was so far down the list, and essentially made the “we’ll hire him only after we strike out with everyone else option.” Whoever ends up taking the job may operate under the shadow of Fulmer, and under the dark cloud of the warring booster factions. In other words: there might have been a short-term winner in the power struggle at the top of Tennessee’s food chain, but we still don’t know what is the collateral damage caused to the program from this process and may not see indications of it for years to come.